The authors begin by introducing modern systems management and offering practical strategies for coherently managing today’s IT infrastructures. Drawing on their immense consulting experience, they offer expert guidance for ConfigMgr planning, architecture, and implementation. You’ll walk through efficiently performing a wide spectrum of ConfigMgr operations, from managing clients, updates, and compliance to reporting. Finally, you’ll find current best practices for administering ConfigMgr, from security to backups. Using this guide’s proven techniques and comprehensive reference information, you can maximize the value of ConfigMgr in your environment–no matter how complex it is or how quickly it’s changing. Kerrie Meyler, Cloud and Datacenter Management MVP, is the lead author of numerous System Center books in the Unleashed series, including Microsoft Hybrid Cloud Unleashed (2018), System Center 2012 R2 Configuration Manager Unleashed Supplement (2014), System Center 2012 Configuration Manager Unleashed (2012), and System Center Configuration Manager 2007 Unleashed (2009). She also coauthored System Center Configuration Manager Reporting (2016). Kerrie is an independent consultant with more than 20 years of information technology experience. She was responsible for evangelizing Systems Management Server (SMS) while a Senior Technology Specialist at Microsoft and has presented on System Center technologies at TechEd and MMS. Gerry Hampson, Enterprise Mobility MVP, is a senior consultant with Ergo Group, based in Dublin. He has 20 years of technology experience and specializes in deploying Microsoft solutions. Gerry has a bachelor of engineering degree and numerous Microsoft, HP, and Cisco certifications (MCSE, MCITP, ASE, CCNA). He previously coauthored Troubleshooting System Center Configuration Manager (Packt, 2016). Gerry has a popular blog where he shares device management tips and tricks (gerryhampsoncm.blogspot.com). He is an active member of the Windows Management Users Group and regularly presents at user group meetings and conferences in Ireland and the UK. Gerry has worked with SMS and Configuration Manager since SMS 2003. Saud Al-Mishari is a 15-year Microsoft veteran and a Program Manager with the Enterprise Mobility and Management (EMM) group, which owns Microsoft Intune and System Center Configuration Manager. He is part of EMM’s Customer Experience Team (CXP) organization and helps Microsoft’s largest customers deploy and adopt Microsoft Intune. Saud’s career has focused on systems and device management, along with enterprise operations across various roles in consulting and support. He has worked across Europe, the Middle East, and Africa; he has spent significant time working with industry-leading companies in the UK and Saudi Arabia. Greg Ramsey, Enterprise Mobility MVP, is the Enterprise Tools Strategist at Dell, Inc. He has a B.S. in computer sciences and engineering from Ohio State University. Greg coauthored System Center Configuration Manager 2012 R2 Unleashed, System Center Configuration Manager 2012 Unleashed, Microsoft System Center 2012 Configuration Manager: Administration Cookbook (Packt, 2012), and System Center Configuration Manager 2007 Unleashed. Greg is a cofounder of the Ohio SMS Users Group and the Central Texas Systems Management User Group. Kenneth van Surksum, MCT and former MVP, is a trainer and managing consultant at insight24, a company based in the Netherlands. With almost 20 years of experience, Kenneth has worked with SMS 1.2 and successive versions of the product and specializes in OS deployment. Kenneth was a contributing author for System Center 2012 R2 Configuration Manager Unleashed, System Center 2012 Configuration Manager Unleashed, System Center 2012 Service Manager Unleashed, and coauthored Mastering Windows 7 Deployment (Sybex, 2011). Michael Wiles begin working with SMS 1.1 as a Microsoft support engineer in 1997 and was a Senior Premier Field Engineer (PFE) from 2005 to 2012. He now works for NTT Data, as a Configuration Specialist Advisor, leading the infrastructure team and working on transitions and transformations with new customers at NTT Data Services. 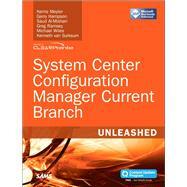 Michael was a contributing author on System Center 2012 R2 Configuration Manager Unleashed Supplement (2014).